I was passing through my library's Technical Services area [? ], and the "to be catalogued" shelf caught my eye. Featured in the photograph here, the titles really struck me as a very accurate cross-section of a modern library's collection. Not only do we have popular/genre fiction (Kilt Dead and Rashi's Daughters), but also represented are the classics (The Odyssey - 2 copies! 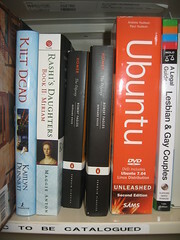 ), up-to-date technology (Ubuntu Unleashed), and social minorities in our community (A Legal Guide for Lesbian & Gay Couples). Not that this is unique to my library, but it did make me happy. There're at least six of us responsible for selecting books for the adult collection, and it's nice to know that, even without direct coordination, we're building a well-rounded collection. It also reminds me that having a solid collection is at least as important as how you organize it; the books need to be there in the first place before better signage or search engines will have an impact.